115 Commercial Real Estate & Properties in Chatswood are listed in 6 categories. We have 59 OfficesSale & Lease , 29 Retail ShopsSale & Lease , 17 Industrial Warehouses Sale & Lease , 5 Other Commercial PropertiesSale & Lease , 4 Medical and Consulting PropertiesSale & Lease and 2 ShowroomsSale & Lease . Located within Victoria Avenue "mall" this prime retail two storey building has an excellent frontage, exclusive building signage and convenient rear access. The ground floor consists of 184 sqm prime retail area with a further 111 sqm located on the upper level. First time vacant in over 30 years, this rare offering will be very much sought after and will be sure to attract National and International interest. • Prime Retail Two Storey Building • Exclusive Building Signage • Excellent Wide Frontage • Rear Lane Access • Ground Floor Area 184sqm • First Floor Area 111sqm • First Time Vacant in Over 30 Year! For further information, please contact Bill Geroulis 0413 100 200 or Anthony Parisi 0415 902 329. Disclaimer: All data is provided for information purposes only and while all care is taken in its presentation, Shead Property does not guarantee or warrant the accuracy, completeness or currency of the information. Close To Public Transport | Fitted And Furnished | Free Meeting Rooms $725pw | 6 Person Workspa..
PROPERTY OVERVIEW $725pw Price incl. Chic shared office space in Chatswood close to the train station and Pacific Highway. This flexible workspace sits in one of Chatswood’s best buildings and boasts a huge, ultra stylish breakout area that flows out onto a beautiful shared balcony – chill out and enjoy expansive westerly views or chat with new connections in this social space. Another bonus is the four (yes, four!) meeting rooms, all of which are bookable free of charge including the impressive boardroom. Forget searching and paying for meeting facilities because all the collaboration and presentation space you need is right here! The available coworking desks sit in an open plan part of the office and benefit from oodles of natural light and superfast internet connection. Trendy, elegant, relaxed and flexible, this rental is perfect for professionals, startups, small businesses and home workers looking for an affordable Chatswood office space. Tower 1 is located on Victoria Avenue between the Pacific Highway and the Chatswood Bus & Rail Interchange. This B Grade building has been recognised with a 4.5 Star NABERS Energy Rating for its energy efficient construction and design, while there are also end of trip facilities and secure bicycle storage available on the premises. There are 400 onsite car parking spots in the basement available independently through Wilson Parking and both road links and public transports are within the immediate vicinity. Step from the office to find Chatswood’s vibrant business and commercial precinct centred around Chatswood Westfield and the Train Station. The advertised office space is perfect for a team of 6. If you need more or less space, we have over 30,000 furnished workspaces all over the world suitable for a team of 1 to 200+. Our award winning team offer a free service that will help you find the perfect solution for your needs, so reach out if you need more help. What you get for your weekly rent , Access to internal breakout areas , Access to kitchen facilities , A local business telephone number and handset , Building outgoings included , Collaborative space with a great community feel , Commercial grade internet , Dedicated desk with business hours access , Electricity usage included , FREE use of the meeting rooms Building features , Abundance of natural light , Air conditioning , Bicycle storage , Car parking in building (Paid) , Daycare only minutes away , Disabled access and facilities , Retail and shopping malls nearby , Rooftop Bar and break out space , Shared office space 150m to Chatswood Bus & Rail Interchange 400m to shops, dining and entertainment at Westfield Chatswood Close access to the Pacific Highway Childcare facilities, schools and gyms nearby Who is Office Hub? Office Hub is the world\'s No.1 marketplace for office space. We have a huge global selection of coworking spaces, serviced offices and shared office spaces with flexible options to suit teams from 1 200 people. We\'ll take you on a tour of all the workspaces that fit your needs and work on your behalf to get the best price possible. We\'ll help you discover how shared office space can be the most beneficial and budget friendly solution for your business. www.office hub.com Conditions apply – the advertised price includes any incentives offered based on a 12 month agreement and is available to new tenants only. Please note that the rental rate may increase for a shorter rental period. A portion of the square meterage factors in access to shared space. Close To Public Transport | Malls Nearby | Prime Location $2975pw | 25 Person Works..
PROPERTY OVERVIEW $2975pw Price incl. Brand new to the market is this modern and light filled serviced office in Chatswood with expansive views and superior business support. Furnished, spacious and comfortable, the wide variety of office suites at this business centre gives flexible workspace options for business of all sizes. Contemporary in style with enterprise grade technology, this space makes it easier to work harder – especially thanks to the polished service of the onsite team. Telephone answering, reception support and concierge services contribute to superior professionalism associated with your brand – from booking meeting rooms to managing your mail and organising catering, this uniquely trained onsite team embarks on your business journey with you. The office is unbranded to provide you with a discreet, friendly environment where clients and staff feel welcome. Whether the home office just doesn't cut it anymore, you’re in between leases, you need a project space or you’re looking for additional business support in a permanent space, this Chatswood serviced office does it all in style. This serviced office is all about location, location, location – Chatswood is one of Sydney’s prime business districts and this office puts you within 50m of public transport, Westfield Chatswood’s shopping and entertainment, childcare facilities and a fitness gym with discounted rates for members at this office. The A grade commercial tower is 4 star NABERS and GBCA accredited to demonstrate remarkable commitment to sustainability while there is secure bike storage, shower and changing facilities, parking for 200+ vehicles and five fast lifts. The office is located on level 13 of 15 granting more natural light and far reaching views for an uplifting effect. Enquire now to get first pick of spaces at this brand new serviced office in Chatswood. The advertised office space is perfect for a team of 25. If you need more or less space, we have over 30,000 furnished workspaces all over the world suitable for a team of 1 to 200+. Our award winning team offer a free service that will help you find the perfect solution for your needs, so reach out if you need more help. What you get for your weekly rent , 24/7 Access , 24/7 Security , Access to kitchen facilities , Building outgoings included , Commercial grade internet (Free) , Dedicated receptionist to manage your calls and greet your guests , Electricity usage included , Premium coffee/tea facilities , Regular cleaning Building features , Air conditioning , Car parking in building (Paid) , Conference facilities available , Contemporary fit out , Direct access to public transport , Onsite Cafe / Restaurant , Private offices and dedicated desks available , Professional working environment , Retail and shopping malls nearby 50m to Chatswood Station. The Avenue bar and restaurant on premises. 100m to Westfield Shopping Mall WHO IS OFFICE HUB? Office Hub has largest collection of shared office space, sublet office space, creative coworking office space and serviced offices, perfect for 1 200 employees. Let us take you on a tour of all the spaces that fit your needs and budget. Our service is complimentary and we work for you and the landlord to negotiate the most competitive deal in the market. Let us show you how shared and serviced offices can be the perfect solution for your business. www.office hub.com.au www.office hub.co.nz Conditions apply A portion of the square meterage factors in access to shared space. The advertised price includes any incentives offered based on a 12 month agreement. If a shorter period is agreed to please note the price may increase accordingly. This promotional offer for new tenants only and may be withdrawn at any time due to space availability. Located amongst the busy commercial and retail hub of Chatswood is this professionally presented fitted out office suite of approximately 56sqm. With convenient access to Chatswood Chase, Chatswood Westfield and the Chatswood Transport interchange this is a great option for any professional. Suited to a range of commercial, professional, medical & consulting uses (STCA). Fitted out commercial suite Close to transport interchange & local eateries One (1) parking space included in rental (tenant to pay levy) Office area 56sqm approx. For more information contact Henry Farrell 0468 868 573 or Anthony Parisi 0415 902 329 Disclaimer: All data is provided for information purposes only and while all care is taken in its presentation Shead Property does not guarantee or warrant the accuracy, completeness or currency of the information. Located in the heart of Chatswood is this versatile ground floor commercial suite of approximately 98sqm. With its own air conditioning and kitchenette, is ideal for a range of commercial, education, medical & consulting type tenants (STCA). Convenient location being in close proximity to Chatswood Chase, Westfield Shopping Centre, local eateries and the Chatswood Transport Interchange. Versatile Ground Floor Commercial Close to local eateries, shopping centres and transport interchange Self controlled air conditioning and own kitchenette 98sqm + two (2) car spaces For more information contact Ivor Zhou 0430 248 867 or Henry Farrell 0468 868 573. Disclaimer: All data is provided for information purposes only and while all care is taken in its presentation Shead Property does not guarantee or warrant the accuracy, completeness or currency of the information. First floor office suite of approximately 82sqm conveniently located directly across the road from Westfield Shopping Centre. Being in close proximity to the Chatswood Transport Interchange and local eateries, this property would be suitable for a range of commercial uses (STCA). Close to Chatswood Transport Interchange Across the road from Westfield Shopping Centre One (1) parking space available at additional cost 82sqm approx. For more information contact Henry Farrell 0468 868 573 or Anthony Parisi 0415 902 329. Disclaimer: All data is provided for information purposes only and while all care is taken in its presentation Shead Property does not guarantee or warrant the accuracy, completeness or currency of the information. 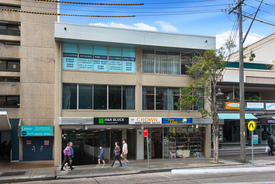 Ground Floor Commercial In The Heart Of Chatswood Call Henry Farrell 0468 8.. Located in the heart of Chatswood is this versatile ground floor commercial suite of approximately 184sqm. With its own air conditioning and three parking spaces this suite would be ideal for a range of commercial, education, medical & consulting type tenants (STCA). Convenient location being in close proximity to Chatswood Chase, Westfield Shopping Centre, local eateries and the Chatswood Transport Interchange. Versatile Ground Floor Commercial Close to local eateries, shopping centres and transport interchange Self controlled air conditioning 184sqm + three (3) car spaces Parking available at additional cost. For more information contact Henry Farrell 0468 868 573 or Bill Geroulis 0413 100 200. Disclaimer: All data is provided for information purposes only and while all care is taken in its presentation Shead Property does not guarantee or warrant the accuracy, completeness or currency of the information. Located within "The Gallery" building in the retail hub of Victoria Avenue, this retail shop has prime positioning being only moments from the Chatswood Railway Interchange and Westfield Shopping Centre. With a wide glass shopfront, this shop enjoys great exposure from busy "The Gallery" arcade, suits for beauty salon, medical, professional and range of retail uses (STCA). Located within "The Gallery" building Full height glass shop frontage Shop – 44sqm Storage – 24sqm Total – 68sqm (approx.) High pedestrian traffic One car space included For further information, please contact Ivor Zhou 0430 248 867 or Bill Geroulis 0413 100 200. Disclaimer: All data is provided for information purposes only and while all care is taken in its presentation Shead Property does not guarantee or warrant the accuracy, completeness or currency of the information. Commercial Suite With Existing Fit Out Call Henry Farrell 0468 8..
Capturing a light and bright aspect from within a boutique three storey retail/office complex, this fitted out commercial space boasts a 55sqm floorplan. This rewarding opportunity in a tightly held building will suit a variety of small to medium sized businesses including IT, legal, medical, consulting and professional services. The landmark location is directly opposite the entrance to Chatswood Chase shopping centre. With a complete range of high end CBD amenities at the doorstep, the property is a handy five minute stroll to the bus and rail interchange. Existing fit out Landmark CBD location 600m from Chatswood Train Station Security parking available on request Directly opposite Chatswood Chase Contact Henry Farrell 0468 868 573 or Anthony Parisi 0415 902 329 Disclaimer: All data is provided for information purposes only and while all care is taken in its presentation, Shead Property does not guarantee or warrant the accuracy, completeness or currency of the information. Work In Chatswood\'s Boutique Commercial Hub Call Henry Farrell 0468 8..
Chatswood Food/restaurant Opportunity Under Offer Henry Farrell.. Existing Chicken Shop located on Victoria Avenue, Chatswood with great exposure and an area of approximately 117sqm. Complete with grease trap, exhaust and existing fit out, this shop would be ideal for an experienced food operator looking for a new location on a prominent retail strip. An additional 73sqm of first floor space gives the potential for office space, additional seating or a function room. Existing Chicken Shop with fit out Turn key operation ready to go Grease trap and exhaust Rear access with parking Ground floor 117sqm First Floor: 73sqm For more information contact Bill Geroulis 0413 100 200 or Henry Farrell 0468 868 573. Disclaimer: All data is provided for information purposes only and while all care is taken in its presentation, Shead Property does not guarantee or warrant the accuracy, completeness or currency of the information. Spacious Retail Space Available In Lemon Grove Call Bill Geroulis 0413 1..
Boasting as the largest shop in the very popular Lemon Grove Shopping Centre, shop 39 has a spacious area of 325sqm, enjoys direct access from Victoria Avenue and is easily identified with its prominent signage. Located directly opposite Westfield Shopping Centre and less than 200 metres from Chatswood Interchange, Shop 39 is suitable for internet cafe, Karaoke, showroom, medical, professional and range of retail uses (STCA). Shop area 325sqm (as per strata plan) Direct access from Victoria Avenue One car space included Opposite Westfield Shopping Centre Prominent signage opportunity Contact Ivor Zhou 0430 248 867 or Bill Geroulis on 0413 100 200 for further information. Exclusive Leasing Agents SHEAD PROPERTY Disclaimer: All data is provided for information purposes only and while all care is taken in its presentation, Shead Property does not guarantee or warrant the accuracy, completeness or currency of the information. Ground Floor Shop/showroom In Landmark Location Call Bill Geroulis 0413 1.. Located on the corner of Victoria Avenue and Penshurst Street, Chatswood we present this 93sqm ground floor property consisting of a modern, open plan fit out with exclusive bathroom and kitchen facilities. Boasting up to 5 on site car spaces with additional visitor parking, this is a rare and unique convenience for any business. With direct access to Victoria Avenue, prominent frontage and excellent signage opportunity, this property is a must to inspect! Prominent location on Victoria Avenue, Chatswood Modern, open plan fit out with exclusive kitchen and bathroom facilities Approximately 93sqm with five (5) on site car spaces Landmark Location For further information, please contact Bill Geroulis 0413 100 200 or Anthony Parisi 0415 902 329 Exclusive Leasing Agents SHEAD PROPERTY Disclaimer: All data is provided for information purposes only and while all care is taken in its presentation Shead Property does not guarantee or warrant the accuracy, completeness or currency of the information. Close To Public Transport | Great Location | Professional Space $608pw | 5 Person Workspa..
PROPERTY OVERVIEW $608pw Price incl. Brand new to the market is this modern and light filled serviced office in Chatswood with expansive views and superior business support. Furnished, spacious and comfortable, the wide variety of office suites at this business centre gives flexible workspace options for business of all sizes. Contemporary in style with enterprise grade technology, this space makes it easier to work harder – especially thanks to the polished service of the onsite team. Telephone answering, reception support and concierge services contribute to superior professionalism associated with your brand – from booking meeting rooms to managing your mail and organising catering, this uniquely trained onsite team embarks on your business journey with you. The office is unbranded to provide you with a discreet, friendly environment where clients and staff feel welcome. Whether the home office just doesn't cut it anymore, you’re in between leases, you need a project space or you’re looking for additional business support in a permanent space, this Chatswood serviced office does it all in style. This serviced office is all about location, location, location – Chatswood is one of Sydney’s prime business districts and this office puts you within 50m of public transport, Westfield Chatswood’s shopping and entertainment, childcare facilities and a fitness gym with discounted rates for members at this office. The A grade commercial tower is 4 star NABERS and GBCA accredited to demonstrate remarkable commitment to sustainability while there is secure bike storage, shower and changing facilities, parking for 200+ vehicles and five fast lifts. The office is located on level 13 of 15 granting more natural light and far reaching views for an uplifting effect. Enquire now to get first pick of spaces at this brand new serviced office in Chatswood. The advertised office space is perfect for a team of 5. If you need more or less space, we have over 30,000 furnished workspaces all over the world suitable for a team of 1 to 200+. Our award winning team offer a free service that will help you find the perfect solution for your needs, so reach out if you need more help. What you get for your weekly rent , 24/7 Access , 24/7 Security , Access to kitchen facilities , Building outgoings included , Commercial grade internet (Free) , Dedicated receptionist to manage your calls and greet your guests , Electricity usage included , Premium coffee/tea facilities , Regular cleaning Building features , Air conditioning , Car parking in building (Paid) , Conference facilities available , Contemporary fit out , Direct access to public transport , Onsite Cafe / Restaurant , Private offices and dedicated desks available , Professional working environment , Retail and shopping malls nearby 50m to Chatswood Station. The Avenue bar and restaurant on premises. 100m to Westfield Shopping Mall WHO IS OFFICE HUB? Office Hub has largest collection of shared office space, sublet office space, creative coworking office space and serviced offices, perfect for 1 200 employees. Let us take you on a tour of all the spaces that fit your needs and budget. Our service is complimentary and we work for you and the landlord to negotiate the most competitive deal in the market. Let us show you how shared and serviced offices can be the perfect solution for your business. www.office hub.com.au www.office hub.co.nz Conditions apply A portion of the square meterage factors in access to shared space. The advertised price includes any incentives offered based on a 12 month agreement. If a shorter period is agreed to please note the price may increase accordingly. This promotional offer for new tenants only and may be withdrawn at any time due to space availability. Close To Train | Fitted And Furnished | Free Meeting Rooms $166pw | 2 Person Workspa..
PROPERTY OVERVIEW $166pw Price incl. Shared office space right next to Chatswood train station. The tenants at this office have two 3 person private offices and 8 open plan coworking desks that they don’t use, giving small businesses and individuals the chance to rent a workspace in their fantastically located Chatswood office. They are open to who comes in and shares office space with them – whether you’re a freelancer, startup, entrepreneur or small business, you’ll hit the ground running as furniture, internet and printing facilities are already in place. The shared office has a bold and jazzy look to set you apart with abundant natural light, high ceilings and underlying quality evident throughout, so the new tenant can impress clients whether they’re in a corporate or creative line of work. As well as your personal workspace, you’ll share modern facilities including a spacious reception/breakout/kitchen area to hold casual meetings or enjoy a break from work. There’s also a smart meeting room that you can use any time you like. 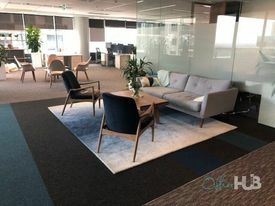 Everything mentioned is included in the rate as well as all utilities and cleaning making this excellent value for a sought after Chatswood office space. This is surely the best location in Chatswood. The shared office space is literally right next to Chatswood Interchange to put trains, buses, Woolworths and 70 specialty stores at your fingertips. Since opening, the Interchange has pioneered exciting international chefs, intimate shopping experiences and plenty of conveniences, turning this Lower North Shore hub into a real destination for the working professional. The modern office building has bicycle storage, disabled facilities and air conditioning and you are able to place your company branding in the foyer. Other useful attractions and amenities nearby include Fitness First, Target, Meriton Suites and Chatswood’s main schools while the Pacific Highway is just seconds away so you can drive home and to other parts of Sydney with ease. The advertised office space is perfect for a team of 2. If you need more or less space, we have over 30,000 furnished workspaces all over the world suitable for a team of 1 to 200+. Our award winning team offer a free service that will help you find the perfect solution for your needs, so reach out if you need more help. What you get for your weekly rent , 24/7 Access and Security , Access to internal breakout areas and kitchen facilities , Access to secure printer and scanner , Building outgoings included , Electricity usage included , Flexible terms , FREE use of the meeting rooms , Lockable storage unit , One simple bill for everything related to your workspace , Plug and play furnished workspace , Regular cleaning , Secure high speed Internet Building features , Abundance of natural light , Air conditioning , Bicycle storage , Car parking Street / Public Car Park (Paid) , Company branding in foyer , Direct access to train station , Disabled access and facilities , Gym and fitness centre close by , Onsite Cafe / Restaurant , Print, scan and copy facilities , Taxi / Uber stand close to building Direct access to Chatswood Train Station Easy access to Pacific Highway 50m to Westfield Shopping Mall Direct access to Woolworths Chatswood 10km from Sydney CBD Who is Office Hub? Office Hub is the world\'s No.1 marketplace for office space. We have a huge global selection of coworking spaces, serviced offices and shared office spaces with flexible options to suit teams from 1 200 people. We\'ll take you on a tour of all the workspaces that fit your needs and work on your behalf to get the best price possible. We\'ll help you discover how shared office space can be the most beneficial and budget friendly solution for your business. www.office hub.com Conditions apply – the advertised price includes any incentives offered based on a 12 month agreement and is available to new tenants only. Please note that the rental rate may increase for a shorter rental period. A portion of the square meterage factors in access to shared space. Affordable, Fitted Office Space With Parking $200psqm Ex GST - Call An.. Highly accessible, fitted office space available at extremely affordable rental. Located in Chatswood Business Park with entries from Eastern Valley Way and Lower Gibbes Street. This location is synonymous with large format retail and logistics tenants, providing the opportunity for office or showroom tenants to excel in this space. Approximately 166sqm of fitted out space with great natural light, 2 car spaces and potential for building signage (STCA) For further information, please contact Anthony Parisi 0415 902 329 or Henry Farrell 0468 868 573 Exclusive Leasing Agents SHEAD PROPERTY Disclaimer: All data is provided for information purposes only and while all care is taken in its presentation Shead Property does not guarantee or warrant the accuracy, completeness or currency of the information. Prime Retail – High Exposure Call Bill Geroulis - 0413.. Beautifully presented retail shop in the heart of one of Sydney's most sought after and tightly held retail precincts – it doesn't get much better! 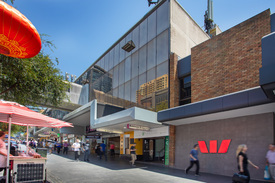 398 Victoria Avenue Chatswood is strategically located within Victoria Avenue Mall, surrounded by quality tenants and adjoining Westfield Shopping Centre. With a unique wide glass frontage, you are guaranteed not to be missed by the daily thousand passer by shoppers, an opportunity not to be missed! • Adjoining Westfield Shopping Centre • Massive Exposure • Wide Glass Frontage • Absolute Prime Location For further information, please contact Bill Geroulis 0413 100 200 or Anthony Parisi 0415 902 329. Exclusive Leasing Agents SHEAD PROPERTY Disclaimer: All data is provided for information purposes only and while all care is taken in its presentation Shead Property does not guarantee or warrant the accuracy, completeness or currency of the information. Abundance Of Natural Light | Shared Space | Cafes And Shops Nearby $207pw | 3 Person Workspa..
PROPERTY OVERVIEW $207pw Price incl. Shared office space right next to Chatswood train station. The tenants at this office have two 3 person private offices and 8 open plan coworking desks that they don’t use, giving small businesses and individuals the chance to rent a workspace in their fantastically located Chatswood office. They are open to who comes in and shares office space with them – whether you’re a freelancer, startup, entrepreneur or small business, you’ll hit the ground running as furniture, internet and printing facilities are already in place. The shared office has a bold and jazzy look to set you apart with abundant natural light, high ceilings and underlying quality evident throughout, so the new tenant can impress clients whether they’re in a corporate or creative line of work. As well as your personal workspace, you’ll share modern facilities including a spacious reception/breakout/kitchen area to hold casual meetings or enjoy a break from work. There’s also a smart meeting room that you can use any time you like. 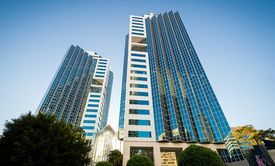 Everything mentioned is included in the rate as well as all utilities and cleaning making this excellent value for a sought after Chatswood office space. This is surely the best location in Chatswood. The shared office space is literally right next to Chatswood Interchange to put trains, buses, Woolworths and 70 specialty stores at your fingertips. Since opening, the Interchange has pioneered exciting international chefs, intimate shopping experiences and plenty of conveniences, turning this Lower North Shore hub into a real destination for the working professional. The modern office building has bicycle storage, disabled facilities and air conditioning and you are able to place your company branding in the foyer. Other useful attractions and amenities nearby include Fitness First, Target, Meriton Suites and Chatswood’s main schools while the Pacific Highway is just seconds away so you can drive home and to other parts of Sydney with ease. The advertised office space is perfect for a team of 3. If you need more or less space, we have over 30,000 furnished workspaces all over the world suitable for a team of 1 to 200+. Our award winning team offer a free service that will help you find the perfect solution for your needs, so reach out if you need more help. What you get for your weekly rent , 24/7 Access and Security , Access to internal breakout areas and kitchen facilities , Access to secure printer and scanner , Building outgoings included , Electricity usage included , Flexible terms , FREE use of the meeting rooms , Lockable storage unit , One simple bill for everything related to your workspace , Plug and play furnished workspace , Regular cleaning , Secure high speed Internet Building features , Abundance of natural light , Air conditioning , Bicycle storage , Car parking Street / Public Car Park (Paid) , Company branding in foyer , Direct access to train station , Disabled access and facilities , Gym and fitness centre close by , Onsite Cafe / Restaurant , Print, scan and copy facilities , Taxi / Uber stand close to building Direct access to Chatswood Train Station Easy access to Pacific Highway 50m to Westfield Shopping Mall Direct access to Woolworths Chatswood 10km from Sydney CBD Who is Office Hub? Office Hub is the world\'s No.1 marketplace for office space. We have a huge global selection of coworking spaces, serviced offices and shared office spaces with flexible options to suit teams from 1 200 people. We\'ll take you on a tour of all the workspaces that fit your needs and work on your behalf to get the best price possible. We\'ll help you discover how shared office space can be the most beneficial and budget friendly solution for your business. www.office hub.com Conditions apply – the advertised price includes any incentives offered based on a 12 month agreement and is available to new tenants only. Please note that the rental rate may increase for a shorter rental period. A portion of the square meterage factors in access to shared space. Retail Shop With Excellent Exposure And Extensive Signage Leased by Henry Farrell 0..
Retail shop of approximately 50sqm located on Spring Street directly opposite Westfield Shopping Centre. With great exposure and extensive signage this shop would be ideal for a range of uses including retail, beauty/hair dressing, medical, consulting or professional services (STCA). Directly across the road from Westfield Chatswood Excellent exposure with extensive signage Suited to a range of uses (STCA) 50sqm approximately For more information Call Henry Farrell 0468 868 573 or Ivor Zhou 0430 248 867. Disclaimer: All data is provided for information purposes only and while all care is taken in its presentation Shead Property does not guarantee or warrant the accuracy, completeness or currency of the information. Level 1 office space for lease in tightly held Chatswood Village with abundant natural light. Exposure to passing foot and vehicular traffic on Oscar Street combined with floor to ceiling windows on two sides makes this office suite a must see! Highly suitable for consulting rooms. Property features include: Bright windows on two sides Private level 1 office Signage options available Internal toilet/wc Ducted a/c Contact Sutton Anderson for more information today. Ex-dental Practice Only 80 Metres From Chatswood Railway Interchange Call Henry Farrell 0468 8..
Conveniently located only 80 metres from Chatswood Railway Interchange is this ex dental practice of approximately 84sqm. Fitted out with reception area, 2 consulting rooms, sterilising area, office and a storage/filing room, this premises would be ideal for a dental or medical type use (STCA). There is also one (1) secure car space included in the rental (tenant to pay parking levy). Ex dental practice with fit out Close to Chatswood Transport Interchange Moments from local shopping centres and eateries One (1) car space included (tenant to pay levy) 84sqm approximately For more information contact Henry Farrell 0468 868 573 or Ivor Zhou 0430 248 867. Disclaimer: All data is provided for information purposes only and while all care is taken in its presentation Shead Property does not guarantee or warrant the accuracy, completeness or currency of the information.